Friday Frugal Finds: Vintage Coke crate, Blue mason jar, jewelry, clothes and more! I had a great week thrifting last week after taking the week before that off because we were on vacation. It started with 1/2 price day at Value Village. Then as I was out running errands on Friday with my nephew we came across a family-run Estate sale. I was excited to find this luggage set priced for $20! It was labeled as being 3 pieces but when I got home and unpacked it all it was actually FOUR pieces! Nice rolling suitcases, a duffel bag and a cosmetic/train case type bag. We might be flying somewhere next summer so we needed some more luggage. My husband does have a new set of luggage but we don’t have 2 medium size pieces. Plus if the airlines demolish this luggage I won’t be upset since they were only $5 each! A friend and I met up to go my parking lot yard sale on Saturday and we both found some fun things! I found my jewelry man and managed to find some fun pieces! Paid $5 for all of that. I found a lady selling a bunch of Golden Books for 25¢ each and loved all the Bible story ones. Paid $2 for all of those. Then I happened to walk past a man selling a bunch of vintage type items. I asked and he wanted $10 for the large Ball jar and $10 for the coke crate. That was a great price for the coke crate but I really didn’t want to pay $10 for the mason jar. I walked away and he chased me down a few feet away and said he would take $15 for both of them! So I got the coke crate for $10 and the turquoise mason jar for $5. It is an extra large jar (probably 1/2 gallon?) and it came with the zinc lid too. I already put it to good use on my beach-inspired summer mantel. One last stop and that was Salvation Army. I picked up this Thirty-One skirt purse for $1.99. Great deal for one of those purses and it was in good condition. You can buy interchangeable “skirts” to change out on it. So there’s my finds from last week! How about you? What did you find? Link up or tell me in the comments. Great finds! Super deal on the luggage! You have the BEST sales in your area–I need to come shop with you! Wow! You really raked in the thrifty finds, Christina! I cant’ believe you only paid $15 for the large mason jar and coke crate. What a fabulous deal! (Coke crates here run between $45- $65 while a large mason jar (hard to find) is usually between $25- $50.) 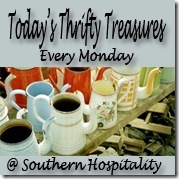 It looks as though your area is a hot spot for thrifty treasures. What a great deal you got! Enjoy that crate. I’d love to have one of those, but I’m dreaming of finding one super cheap one day. A lot of people had them for sale at the Longest Yard Sale. I just figured they all probably wanted too much and skipped along looking for other stuff because the ones I did see the prices on were $12 each. I found some great stuff at Goodwill this week, but it was furniture and I’m hoping no one will buy it and it will be marked down again. Then I can swoop in and get it cheaper. That’s a dream because it is highly unlikely. The 60’s dresser is certainly gone. It was only $40. To me that’s a lot but to some people, it would be a great price and they’ve probably snapped it up. I am just too darn cheap for my own good sometimes.